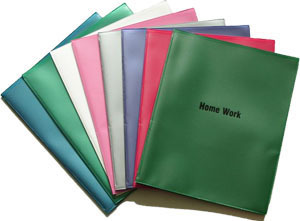 This folder teaches the student how to organize their school work. New Ultrasonic Welding Technology makes possible the best quality polypropylene folder that will last for many school years. 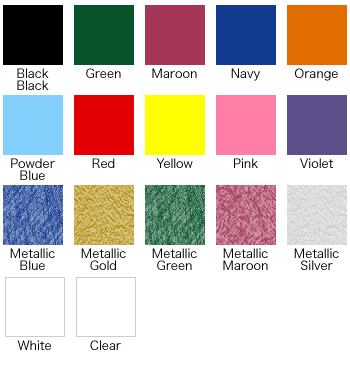 14 Different colors to choose from. A different color for each subject class. Over 5000 schools are now using our folders! Inside Bottom Left Hand Pocket imprint: "ASSIGNMENT"
Inside Bottom Right Hand Pocket imprint: "WORK"
You can uniquely identify your folder with a 4" x 6" stamping of almost anything you want in a variety of colors, right on the cover! Great for School Logos, School Mottos, or both! Parents and Teachers can write messages and slip them into the pocket, right on the cover! 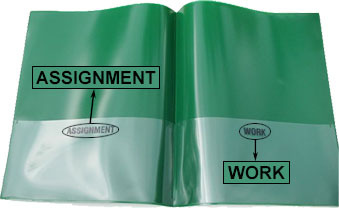 Order School Folders Online Today! for orders of 100 or more folders.